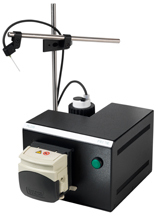 As an extension to Prior’s successful automatic PL200 slide loader, we are pleased to announce the introduction of an automatic oiler to provide even greater levels of automation and flexibility in the field of optical microscopy.The PL220 automatic oiler is ideal for applications in Cytology and Cytogenetics, or other high throughput applications where high magnification, high NA objectives are used. The system provides a highly controlled, automatic system for dispensing immersion oil onto the surface of the slide. Control is via USB or RS232 and a variety of parameters can be optimized for specific applications. The unit can be fitted to all leading microscopes for use with the Prior slide loader or it can be used as a stand alone system for OEM applications. Dimensions (Not including tip support bracket) : 174mm (W) x 130mm (H) x 250mm (D).